Of all of the driving tours that I've taken and written about, one of the ones that I myself take almost every time I'm on Oahu is the drive east, past Diamond Head towards Oahu's Southeast Shore. With the stops we'll be making, you'll want to allow yourself a full day to see and do everything. This Google map will help you plan your trip and show you where the stops along the way are located. Whether you're staying in Honolulu or in one of the hotels, resorts or condominium properties in Waikiki, you'll want to make your way to H1 East. For a slightly more scenic beginning, you can drive down Kalakaua Avenue and make a right turn onto Diamond Head Road at the foot of the mountain. Diamond Head Road wraps around the ocean side of Diamond Head and has some lovely viewpoints. The road changes its name to Kahala Avenue as it proceeds through one of the wealthiest neighborhoods on the island. Keep your eyes out for signs to H1. You'll be making a left onto Kealaolu Avenue which will take you right up to the highway. You'll be heading east on the highway which was called H1. It ends right about where you'll be getting onto it. The road is now called the Kalaniana'ole Highway or Route 72 and it will be your home for most of the day's trip. On this first part of your drive, you'll be driving through many of the commuter neighborhoods of Oahu. Most of the folks who live here commute to work in Honolulu or Waikiki. Many work in the hotels in which you're staying. 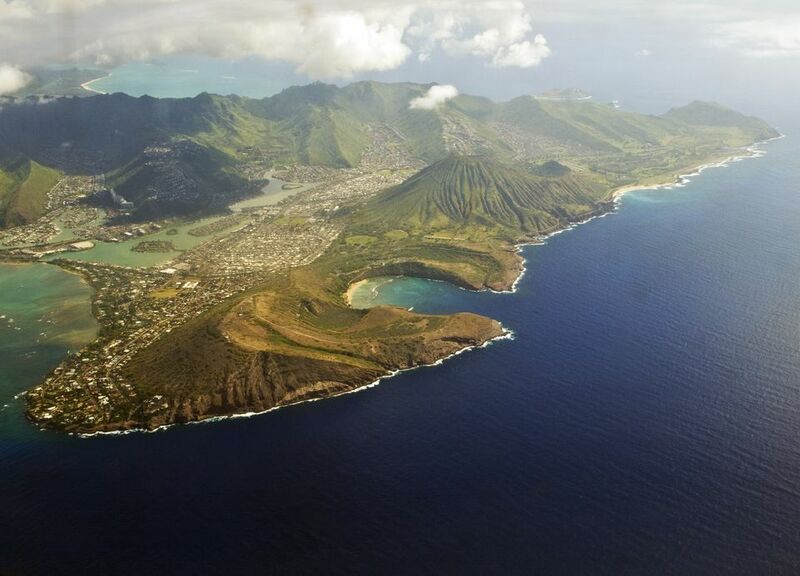 Just past the neighborhood of Hawaii Kai, and up the long hill with Koko Head Crater to your left, keep your eyes out for signs to our first stop Hanauma Bay Nature Preserve. Depending on traffic, the route you took and where you're staying, it should have taken you about a half hour to 45 minutes to reach this stop. Located about 10 miles east of Waikiki just off the main coastal road (Kalaniana'ole Highway, Route 72), Hanauma Bay is the first Marine Life Conservation District in the State of Hawaii. It costs $1.00 per car to park and $7.50 per person to enter the Preserve. A nine minute film is required to be seen to be granted beach access; however, it is well worth it since the snorkeling is some of the best in all of Hawaii. In addition, you'll learn about the importance of preserving Hawaii's delicate marine environment and rules that must be followed when swimming near coral. The Preserve is closed on Tuesdays. In addition, admission is limited to a set number of people, so be sure to arrive early. As you leave Hanauma Bay, make a right turn back onto the highway. Your next stop is less than 2 miles away. Just north of Hanauma Bay off the Kalaniana'ole Highway you'll find the pullout for the Halona Blowhole. The blowhole results when waves are forced into an underwater lava tube and the pressure forces a stream of water to "blow" out the other end shooting high into the air. The Blowhole is most exciting when surf is active on this side of the island. There are days when it is blowing water way into the sky and other days when it is quite quiet. The viewing area and parking lot here have recently been redone. Just to the right is the Halona Beach Cove, also known as Cockroach Cove where the famous love scene between Burt Lancaster and Deborah Kerr in the 1953 movie From Here to Eternity was filmed. Visible from the Blowhole lookout and less than a half mile away is your next stop, Sandy Beach Park. Just down the road from the Halona Blowhole is the long and often very windy Sandy Beach Park. It's a great place to stop and watch folks fly their kites and there are almost always lots of surfers and body boarders testing the surf. The waters off Sandy Beach produce very strong and erratic currents and undertow. It is only for very experienced surfers and body boarders. It is, however, a great place to watch the best of them do their thing in the water. Continue heading north on the highway for a little over two miles and you'll reach our next stop. Just past the Hawaii Kai Golf Course, you'll come to Makapu'u Point. A parking area has recently been built to accommodate folks who want to take the moderate 2-mile hike up to the point and the Makapu'u Point Lighthouse. You'll see the driveway to the parking area on your right. The hike is relatively easy, although it's best in the morning when the sun is less strong. It takes a little over an hour roundtrip. The view of the coast in both directions is amazing. It's a great place to see whales in season. On a clear day you can see the island of Moloka'i in the distance. If you take the hike, be sure to lock your car and remove all of your valuables. As you leave the parking area, make a right and head up the hill. There is another pullout on your right from which there are great coastal views, especially if you have not done the hike to Makapu'u Point. As the road leads back down from Makapu'u Point keep your eye out to the left for Sea Life Park. Sea Life Park is a world-class marine attraction featuring educational displays and live entertainment featuring dolphins, sea lions, penguins. You won't want to miss the world's only known wholphin (offspring of a false killer whale and Atlantic bottlenose dolphin). You may not have time to stop here on this trip, since it is almost a full day experience in itself, but take time to pull in and check our their current hours and prices. They offer several different programs and options. For several of them advance reservations are advised. About four miles further along the highway takes you to the community of Waimanalo Beach which is home to about 4,000 people and where you'll find Waimanalo Beach, my favorite beach on Oahu. You can park in the Waimanalo Beach Park lot, however, much of it has been taken over by homeless people who live there in tents and makeshift houses. A better bet is to drive a bit further down the highway and look for signs for the Waimanalo Bay State Recreation Area. The parking lot here is accessed off a short road into a wooded area. Don't leave any valuables in your car since you won't be able to see it from the beach. Over 5 miles in length with lovely, soft white sand, Waimanalo Beach is rarely crowded on weekdays. It's a great place to meet and talk to a local enjoying this wonderful spot. The swimming is generally excellent since there are rarely large waves. This beach was made famous by Hawaiian singer "IZ" or Israel Kamakawiwo'ole's music video of his classic song White Sandy Beach. After Waimanalo the highway bends inland. You'll pass by Bellows Air Force Station on your right. When you reach Kailua Road you can either make a left and follow the signs for the Pali Highway to return to Honolulu and Waikiki or make a right and take a detour to visit Lanikai Beach and Kailua Beach Park. Kailua and Lanikai are two, primarily residential, neighborhoods on this side of the island. After Honolulu and Waikiki, Kailua is the next largest town on the island and it has some great shopping. Nearby Kailua Beach Park is a very popular recreational beach with excellent swimming. You'll also likely see several windsurfers and an outrigger canoe club practicing. This beach has lifeguards, a picnic area, restrooms with showers, and concessions. Separated from Kailua by Alala Point, your next stop should be Lanikai Beach. Both Kailua Beach Park and Lanikai Beach have been named Best Beach in America by Dr. Beach, aka coastal expert Dr. Stephen P. Leatherman. Lanikai is truly a superb beach, but visiting it is often difficult since parking in Lanikai is very difficult. Lanikai is a small, exclusive community with one looping road. Beach access is only available by a limited number of public access walkways. From the beach you'll have great views of the Mokuluas, two small islands approximately three quarters of a mile off the coast. When your day is done, simply retrace your steps to Kailua Road and follow the signs to the Pali Highway which will take you back to Honolulu. Before you go, be sure to bookmark our large Google map of this trip for your reference as you drive.